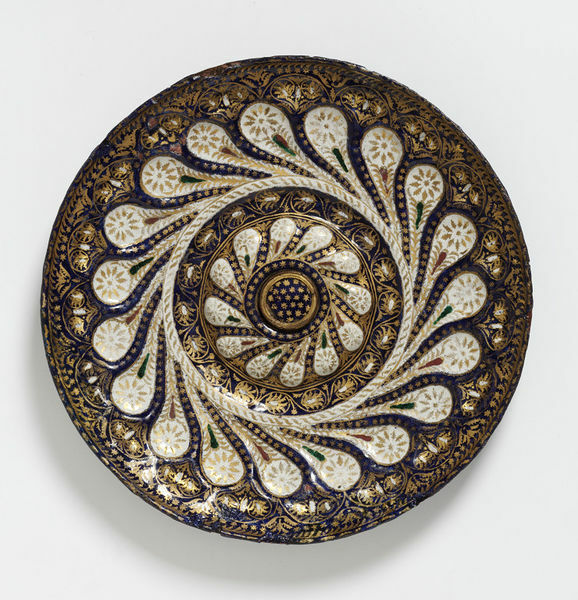 This style of ornamental enamel-work was fashionable in Venice in the late 15th and 16th centuries. The intense colours are produced using a base layer of milky white enamel with blue, green or red enamels applied over the top. The dense gold decoration may have been inspired by Spanish lustre ceramics or Middle Eastern inlaid metalwork. It was 'cold-painted' onto the enamel after firing, and so it wears off easily. This plate could have been used in a church, or at the table of an aristocratic family. During the 16th century, the Italian nobility used a variety of elaborate and precious vessels for formal dining. Servants carried food to the table in decorative dishes, and the most splendid tableware was displayed on sideboards or credenze around the sides of the room. Enamelled copper dish, decorated throughout with foliate patterns and stars painted in gold. The front blue, with white gadroons and details in red and green. The reverse blue with a continuous pattern of gold stars. Bought for 22 l. 1s. This type of ornamental enamel-work was fashionable in Venice during the late 15th and 16th centuries, and was applied to vessels intended for both secular and sacred use. 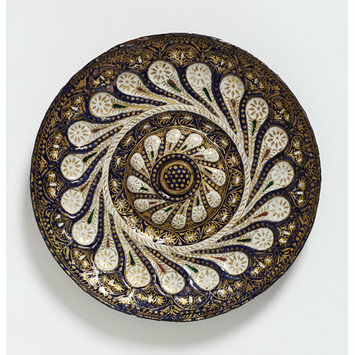 This dish may have been used in a church, or at the table of a noble family. During the 16th century, a great variety of elaborate and precious vessels were used by the Italian nobility for formal dining. A banquet would have been conceived as a spectacle, with servants carrying food to the table in beautiful dishes, and the most splendid tableware displayed on tiered sideboards or credenze around the sides of the room. The technique of painting in enamels on copper was developed in the second half of the 15th century, and Venice quickly developed its own characteristic style. Vessels were made from thin copper, usually with a lobed or gadrooned form, and coated with a layer of milky white enamel. The intense, almost translucent colours applied over this base layer included dark blue, emerald green and deep red, with some areas left white for contrast. Finally, the surface was decorated with dense patterns of tiny gold stars, commas, flowers, and leafy scrolls. Venetian enamel-workers may have been influenced by lustre ceramics from Valencia, which were imported to Italy in large quantities between the 14th and 16th centuries. These Spanish wares made use of dense geometric and foliate patterns, shimmering in lustre on a white ground. They also imitated metalwork forms, such as gadrooning, and so their decorative motifs could be adapted relatively directly for use on metal dishes such as this. Similar ribbed and gadrooned forms were also employed in Murano cups of the period, made from enamelled white glass, which could also have been an influence on Venetian enamel-workers; the fluting of the glass was derived from Byzantine models, and ultimately from Near Eastern mould-blown glass. The use of continuous patterns of gold scrollwork to cover all surfaces of the objects may also have been influenced by Middle Eastern design. Venice had close connections with the Islamic world in the Renaissance, and inlaid metalwork covered in foliate arabesque patterns was imported to the city from the Middle East.